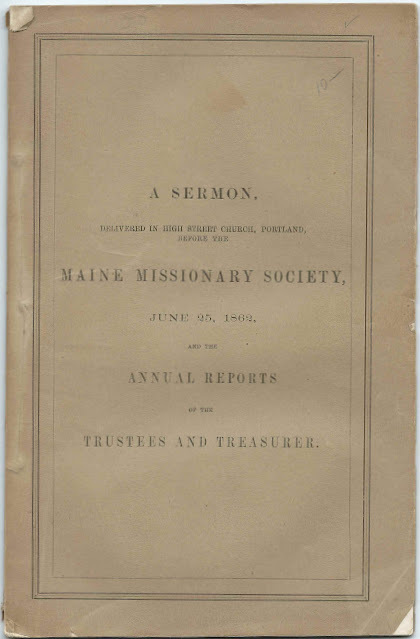 Included in a booklet entitled A Sermon Delivered in High Street Church, Portland, Before the Maine Missionary Society, June 25, 1862, and the Annual Reports of the Trustees and Treasurer is a list of the Maine towns with missions supported by the Maine Missionary Society, as well as the ministers and laypeople who ministered to them and interesting remarks about many of the missions. 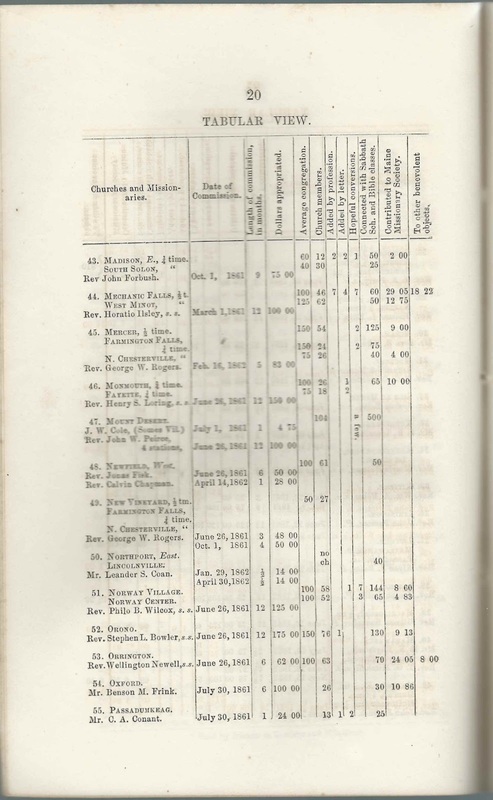 The towns are numbered, with several pages of correspondingly numbered remarks. 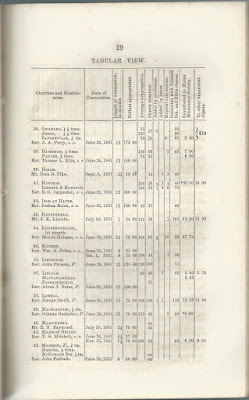 Refer to pages 23-26 in the online version of this booklet offered by the Yale University Library. There's interesting genealogical content in the remarks. A Abbot - 1/4 time; Guilford - 1/2 time; Sangerville - 1/4 time Rev. John A. Perry, s.s.
Acton Rev. Francis P. Smith, s.s.
Aroostook County, 5 stations Rev. Marcus R. Keep, s.s.
B Belfast, North - 3/4 time; Swanville - 1/4 time Rev. Truman A. Merrill, s.s.
Bingham; Anson; Solon Village Rev. G. W. Hathaway, s.s.
Brownfield Rev. 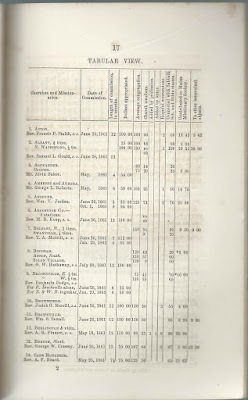 Josiah G. Merrill, s.s.
C Cape Elizabeth Mr. Augustus F. Beard, s.s.
Carmel & Pittsfield 1/4; St. Albans 1/4; Plymouth & Dixmont 1/4; Palmyra 1/4 Rev, Daniel Sewall, s.s.
Dixfield; Mexico; Peru Mr. James P. Chamberlain, s.s.
Dixmont & Plymouth 1/4; St. Albans 1/4; Pittsfield & Carmel 1/4; Palmyra 1/4 Rev. Daniel Sewall, s.s.
F Fayette - 1/4 time; Monmouth - 3/4 time Rev. Henry S. Loring, s.s.
Fort Fairfield; Washburn; Littleton; Monticello; Presque Isle Rev. Elbridge Knight, s.s.
Gilead Rev. Henry Richardson, s.s.
Golden Ridge (Sherman); Patten - 1/3 time; Island Falls - 1/3 time Rev. William T. Sleeper, s.s.
Gouldsborough - 3 stations Rev. 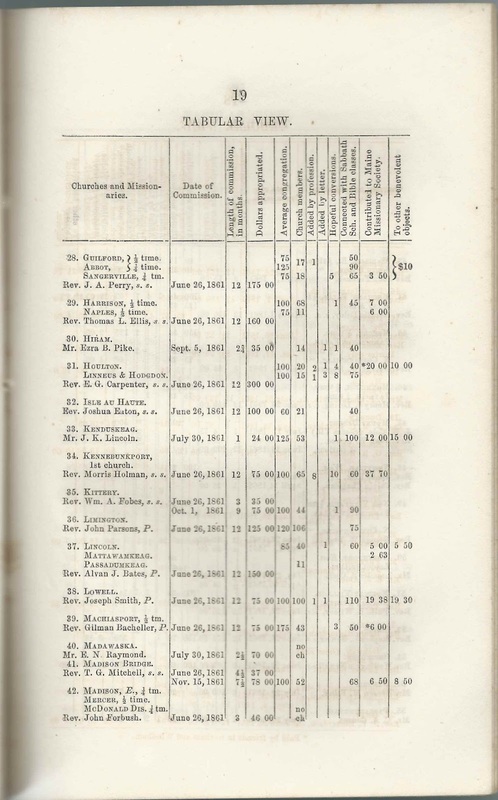 David S. Hibbard, s.s.
Guilford - 1/2 time; Abbot - 1/4 time; Sangerville - 1/4 time Rev. John A. Perry, s.s.
H Harrison, 1/2 time; Naples - 1/2 time Rev. Thomas L. Ellis, s.s.
Hartford, South; Sumner Rev. 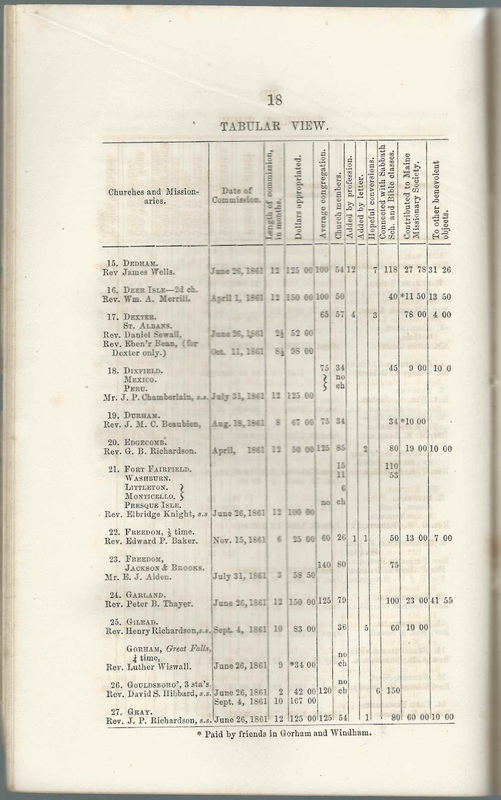 Benjamin G. Willey, P.
Hodgdon; Houlton; Linneus Rev. 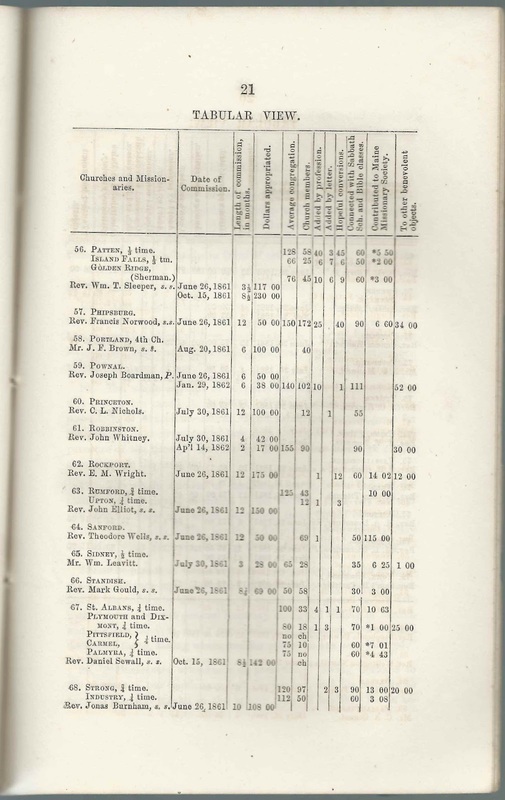 E. G. Carpenter, s.s.
Houlton; Linneus; Hodgdon Rev. 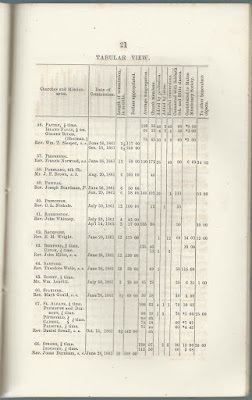 E. G. Carpenter, s.s.
Island Falls - 1/3 time; Patten - 1/3 time; Golden Ridge (Sherman} Rev. William T. Sleeper, s.s.
Isle au Haut Rev. 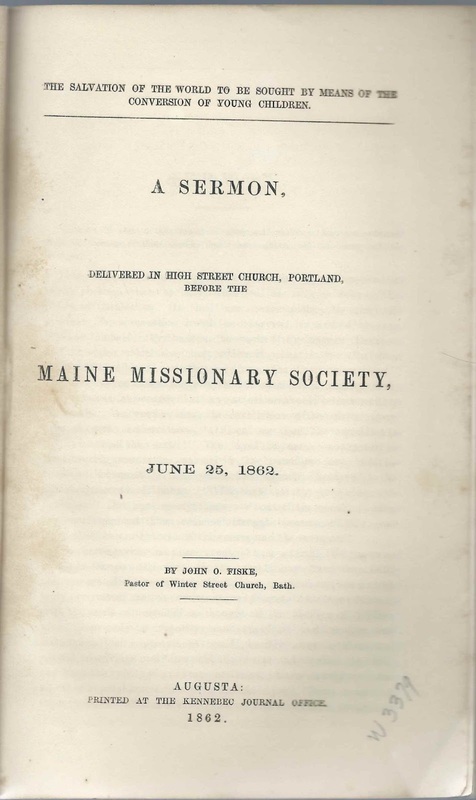 Joshua Eaton, s.s.
Kennebunkport - 1st church Rev. Morris Holman, s.s.
Kittery Rev. William A. Fobes, s.s.
Limington Rev. John Parsons, P.
Lincoln; Mattawamkeag; Passadumkeag Rev. Alvan J. Bates, P.
Linneus; Houlton; Hodgdon Rev. E. G. Carpenter, s.s.
Littleton; Fort Fairfield; Washburn; Monticello; Presque Isle Rev. Elbridge Knight, s.s.
Lovell [printed erroneously as Lowell] Rev. Joseph Smith, P.
M Machiasport - 1/2 time Rev. Gilman Bacheller, P.
Madison Bridge Rev. 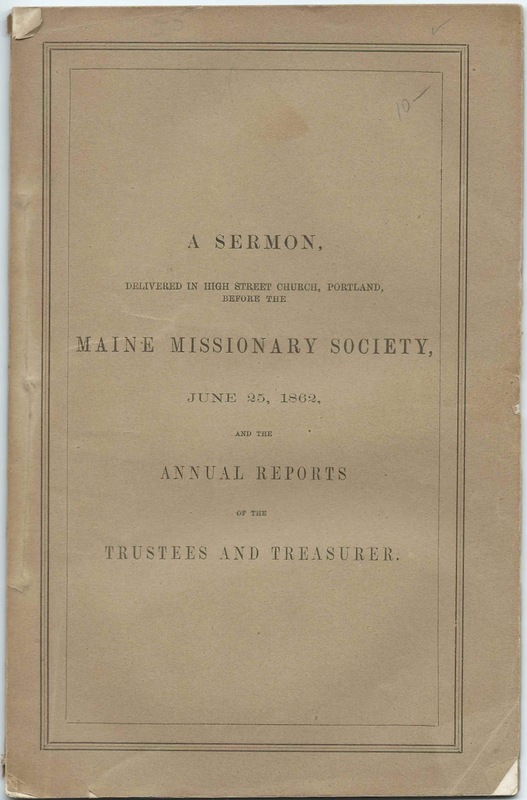 Thomas G. Mitchell, s.s.
Mattawamkeag; Lincoln; Passadumkeag Rev. Alvan J. Bates, P.
Mechanic Falls - 1/2 time; West Minot - 1/2 time Rev. Horatio Ilsley, s.s.
Mexico; Dixfield; Peru Mr. James P. Chamberlain, s.s.
Minot, West - 1/2 time; Mechanic Falls - 1/2 time Rev. 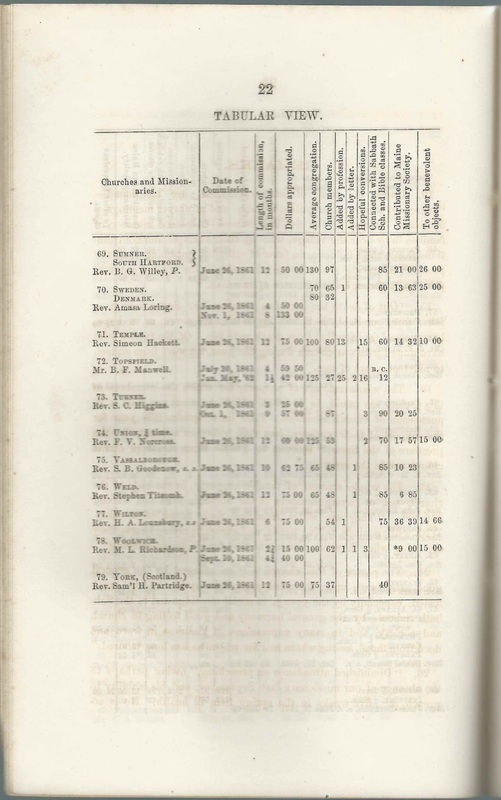 Horatio Ilsley, s.s.
Monmouth - 3/4 time; Fayette - 1/4 time Rev. Henry S. Loring, s.s.
Monticello; Fort Fairfield; Washburn; Littleton; Presque Isle Rev. Elbridge Knight, s.s.
Naples - 1.2 time; Harrison - 1/2 time Rev. Thomas L. Ellis, s.s.
North Waterford - 1/2 time; Albany - 1/2 time Rev. Samuel L. Gould, s.s.
Norway Village; Norway Center Rev. Philo B. Wilcox, s.s.
O Orono Rev. Stephen L. Bowler, s.s.
Orrington Rev. Wellington Newell, s.s.
Palmyra 1/4; St. Albans 1/4; Plymouth & Dixmont 1/4; Pittsfield & Carmel 1/4 Rev. Daniel S. Sewall, s.s.
P Passadumkeag; Lincoln; Mattawamkeag Rev. 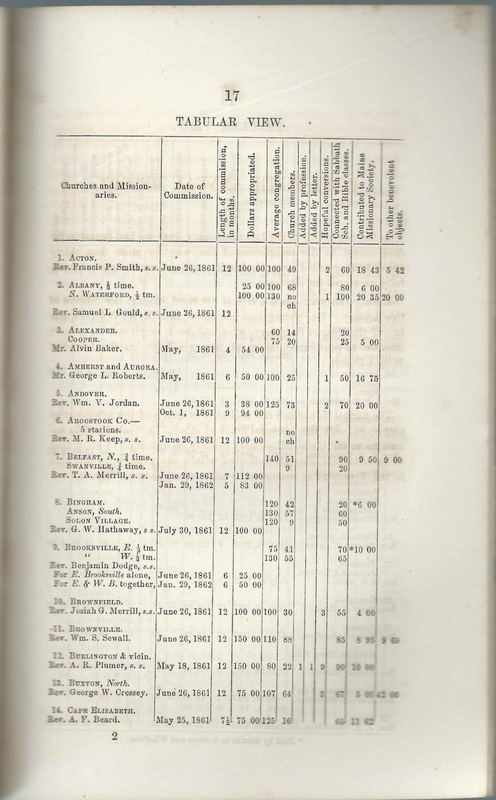 Alvan J. Bates, P.
Patten - 1/3 time; Island Falls - 1/3 time; Golden Ridge (Sherman) Rev. 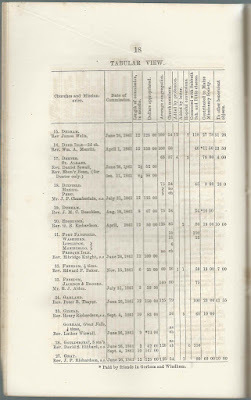 William T. Sleeper, s.s.
Peru; Dixfield; Mexico Mr. James P. Chamberlain, s.s.
Phippsburg Rev. Francis Norwood, s.s.
Pittsfield & Carmel 1.4; St. Albans 1/4; Plymouth & Dixmont 1/4; Palmyra 1/4 Rev. Daniel Sewall, s.s.
Plymouth & Dixmont 1/4; St. Albans 1/4; Pittsfield & Carmel 1/4; Palmyra 1/4 Rev. Daniel Sewall, s.s.
Pownal Rev. Joseph Boardman, P.
Presque Isle; Fort Fairfield; Washburn; Littleton; Monticello Rev. Elbridge Knight, s.s.
Rumford - 3/4 time; Upton - 1/4 time Rev. John Elliot, s.s.
S Sanford Rev. Theodore Wells, s.s.
Sangerville - 1/4 time; Guilford - 1/2 time; Abbot - 1/4 time Rev. John A. Perry, s.s.
Sherman (Golden Ridge); Island Falls - 1/3 time; Patten - 1/3 time Rev. William T. Sleeper, s.s.
St. Albans, 1/4; Plymouth & Dixmont, 1/4; Pittsfield & Carmel, 1/4; Palmyra, 1/4 Rev. Daniel Sewall, s.s.
Standish Rev. Mark Gould, s.s.
Sumner; South Hartford Rev. Benjamin G. Willey, P.
Swanville - 1/4 time; Belfast North - 3/4 time Rev. Truman A. Merrill, s.s.
Upton - 1/4 time; Rumford - 3/4 time Rev. John Elliot, s.s.
Vassalboro Rev. S. B. Goodenow, s.s.
W Washburn; Fort Fairfield; Littleton; Monticello; Presque Isle Rev. Elbridge Knight, s.s.
Waterford, North - 1/2 time; Albany - 1/2 time Rev. Samuel L. Gould, s.s.
West Minot - 1/2 time; Mechanic Falls - 1/2 time Rev. Horatio Ilsley, s.s.
Y York (Scotland) Rev. 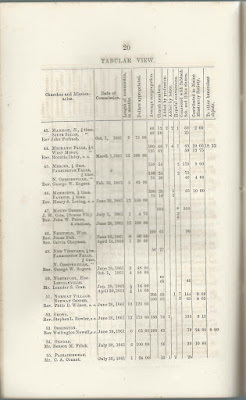 Samuel H. Partridge, s.s.
Alphabetical list of the ministers and laymen serving Maine missions supported by the Maine Missionary Society. 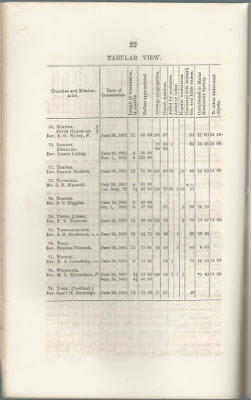 Again, refer to pages 23-26 of the online version of this booklet to view the numbered remarks that correspond to the numbered towns. There's interesting genealogical content in the remarks. Rev. Josiah G. Merrill, s.s. If you have information to share on any of the people mentioned, please leave a comment or contact me directly.